A rapidly escalating measles outbreak near Portland, OR has led local health officials to declare a public health emergency, with 44 confirmed cases, almost all in unimmunized children. Meanwhile, New York and New Jersey have been facing a similar crisis over the past few months, with over 200 confirmed cases of the measles tearing through the ultra-orthodox Jewish communities in the area, where individuals are also largely unvaccinated. The Centers for Disease Control reports that 2018 had the second-highest number of annual measles cases since measles was eliminated in the U.S. in 2000. The fact that the measles spreads so rapidly through unprotected populations should be no surprise. Measles is among the most highly infectious viral diseases known, and up to 90% of non-immune exposed individuals will catch the disease. The measles virus lives in the throat and nasal mucous of the infected patient, and spreads by a means known as droplet transmission. A patient harboring the measles virus can cough or sneeze in an enclosed airspace and the shed measles virus can float there for up to two hours, a malignant invisible cloud waiting to attach to the next unsuspecting victim who walks through, long after the first patient has come and gone. Furthermore, infected individuals are contagious for up to 4 days before evincing signs of the characteristic measles rash, and if not put in quarantine, can continue to infect others for up to four days afterwards. In the current Portland outbreak, public health officials have determined that during their window of infectivity, patients with the measles had visited schools and churches, Costco, Ikea, and Concourse D of the Portland International Airport, exposing all those moving unsuspectingly in their wake. Stories of these outbreaks—or news that the World Health Organization has named “Vaccine Hesitancy” (defined as the reluctance or refusal to vaccinate despite the availability of vaccines) one of the top ten threats to global health—leads to a host of predictable public reactions. There is the standard public excoriation of those who choose not to vaccinate (“selfish,” “uneducated” “should be jailed/banished/executed” are common epithets should you choose to wade through the online comments section of such articles, though I recommend against it) while on the other side, the vaccine-reluctant dig in further, often with the sincere belief that they are doing the right thing and protecting their loved ones from the greater harm. These are well-worn trenches and fleshing them out further is not my goal at the moment. What I want to make particular note of is the imagery accompanying the media stories of each new outbreak. 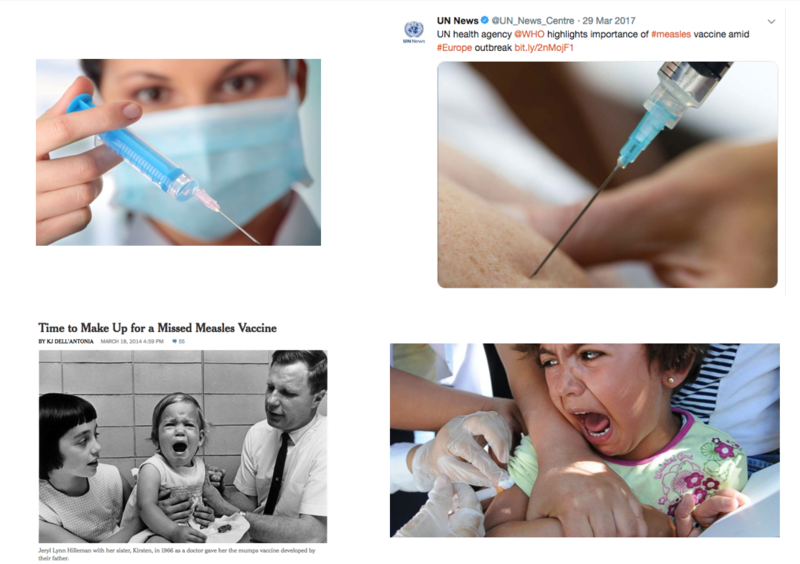 Scrolling through my news feed, I can’t help but notice that nearly every top image included in articles about vaccine-preventable outbreaks shows the same few vignettes, as if culled from the same massive themed stock photo set. And somehow, the focus is always on the needle-stick (or the “jab,” as British call it with what feels like barely restrained glee). There’s the ultra-close-up of the syringe aspirating back from the bottle of multi-dose vaccine, or being brandished menacingly by a masked healthcare provider, poised to strike. There’s the image of the needle in the arm depicting the moment of peak anxiety—the pointed tip actually tenting the skin before the moment it pierces through. And then, of course, there’s the countless images of children wailing and being restrained, the medical staff looming over them like assailants as they deliver their immunogenic payload. Invariably, the photos accompanying the articles I come across—solidly medical, pro-science articles coming out strongly in favor of near universal vaccination and preventative care—somehow sabotage their own message by highlighting the point of maximal tension in the vaccine schism. In discussing the dangers of under-immunization, are we often accidentally advertising for the other side? And in all honesty, I’ve lived at that point of tension. Many of us have, regardless of our background. I’m a physician, and I never once doubted that I would fully immunize all my children on the standard schedule—that immunizing them was the best thing I could do to keep them healthy. And yet, there’s still … that moment. You bring your infant into the pediatrician’s office, the small, soft infant you’ve tried to keep safe at all cost, strip them down in a cold room through you’ve always tried to keep them warm, allow sharp needles to pierce that fresh new skin you work so hard to keep intact, and inject densely labeled pharmaceutical agents into their body when everything so far has been deliberately simple and overtly sterilized and gently fragrance-free. It’s a tension that exists beyond logic. It’s a tension of nearly pure emotion. I, of course, wanted my baby to be vaccinated—celebrated the opportunity to so effectively protect them from disease—but there’s that other, sub-cerebral instinct to protect that occasionally runs the intellectual facts you know to be true. As a physician, I am as exasperated by vaccine refusal. But I am also sensitive to that inchoate instinct towards protection. And at times I view vaccine refusal in some ways as that protective instinct run amok. Buffered by gut feeling, discomfort, and questionable information, people who avoid vaccinating their children do so because they’re more afraid of the vaccine than the diseases we seek to prevent. It has been said that the universal vaccination campaign is a victim of its own success, and that as immunization efforts push once common diseases further into the background, parents have the luxury of focusing on what feel like the more pressing dangers—mysterious “chemical” peril, pain, the post-immunization fevers that in fact show that the healthy body is responding precisely as they should. Vaccine refusers have reframed the picture and perceive immunization as the threat itself. And images focusing on that key moment of tension, no matter what the intent of the narrative itself, does nothing to shift that perception. In 2012, the CDC launched a $54 million national media campaign aimed at helping current smokers to quit, and to prevent new smokers, particularly children, from ever starting. This campaign, named “Tips From Former Smokers,” used personal stories and graphic pictures—post-operative pictures of disfiguring cancer resection surgeries, excised lungs, respiratory stoma—to more effectively drive home the prevention message in a way mere printed warnings could not. “Although they may be tough to watch, the ads show real people living with real, painful consequences from smoking,” said CDC Director Thomas R. Frieden at the time of this campaign’s launch. “There is sound evidence that supports the use of these types of hard-hitting images and messages to encourage smokers to quit, to keep children from ever beginning to smoke, and to drastically reduce the harm caused by tobacco.” Though there are multifactorial influences on national smoking rates (including taxes on cigarettes and public smoking bans), anti-smoking campaigns have played a role, and per CDC figures the U.S. smoking rate in 2018 hit an all-time low. Public health campaigns aside, regulations regarding general media depictions of tobacco use have also been found to influence smoking rates. The National Cancer Institute has concluded that “Media communications play a key role in shaping tobacco-related knowledge, opinions, attitudes, and behaviors among individuals and within communities,” and that “mass media campaigns designed to discourage tobacco use can change youth attitudes about tobacco use, curb smoking initiation, and encourage adult cessation.” The prevalence of glamourized smoking in films, particularly “youth-rated” movies, has been associated with initiation of tobacco use in young people, and the CDC has gone as far as to suggest that slapping an R rating on movies showing tobacco use could potentially reduce the number of teen smokers by 18%, and prevent up to 1 million premature smoking deaths. In other words, efforts to minimize exposure in vulnerable populations to images which may inadvertently support a harmful false narrative could have a significant positive public health effect. Control of media imagery worked for tobacco prevention. Why can’t we apply these same principles to vaccine promotion? Ideally, medical counseling ultimately should not hinge on fear. Community health workers should start from a position of trust to most effectively serve their patients. But sometimes, when the dangers are real, people need to be a little more scared. And it’s time to stop being so gentle on the issue. Measles is an acute respiratory illness. It is characterized by fever as high as 105˚F, cough, stuffy nose, and red eyes. The characteristic flat rash usually appears about 2 weeks after initial exposure, spreading down from head to trunk to lower extremities like a blotchy coating of red paint. Even in previously healthy children, measles can cause serious illness requiring hospitalization. One in twenty children who gets the measles will develop pneumonia, the most common fatal complication in young children. One out of every 1000 children with the measles will develop acute encephalitis, often resulting in permanent brain damage. One out of every 1000 children with the measles will die of respiratory or neurological complications. One rare but fatal degenerative condition called subacute sclerosing panencephalitis (SSPE) can develop 7 to 10 years after measles infection, a fatal degenerative disease of the central nervous system characterized by behavioral and intellectual deterioration and onset of seizures. These are the real risks of measles infection. 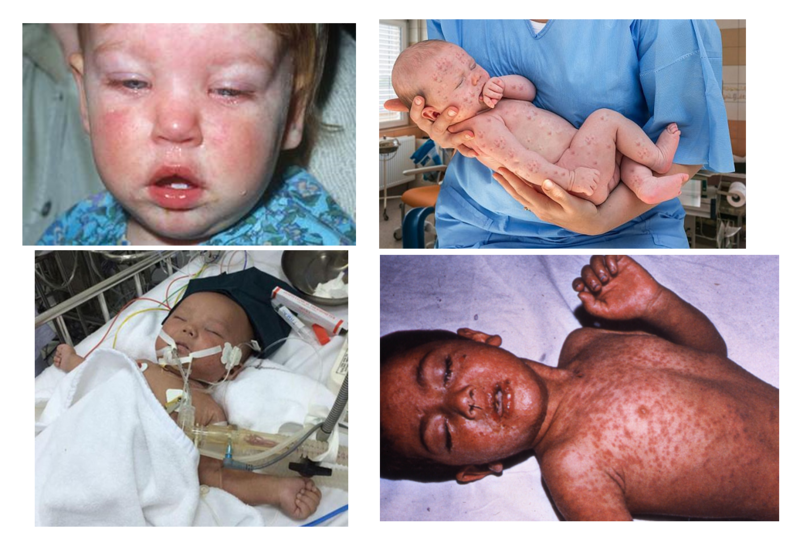 This is what measles look like. The images may be graphic, or upsetting, because it’s hard to see sick children suffer. But that’s precisely the point, and, I’d argue, one made more effectively with pictures than words. This should be what people see in their news feeds. And they are worth the provoked response, particularly in people who glance by and choose not to read the rest of the article. Public health measures ideally should not hinge on fear, but sometimes, people need to be scared of the right things. So in our public depictions of vaccination and disease prevention, let’s help patients understand what there is to be scared of. Let’s choose the right images. Like it or not, we live in a society where people skim the headline, look at the pictures, and scroll on. In framing the topic, and choosing how to illustrate it, let’s focus on what’s actually frightening, and channel that instinctive protective response against what truly endangers our children. Michelle Au is an anesthesiologist and author of This Won’t Hurt A Bit (and other white lies): My Education in Medicine and Motherhood. Next post > What happened to the first name in medicine?